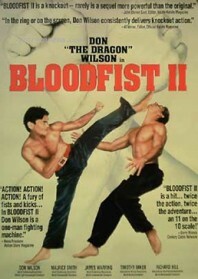 This Bloodfist sequel follows hot on the heels of the huge video success of the first film. World champ’ Jake Raye (Wilson) decides to quit competitive kickboxing after he kills a guy in the ring, only to be lured back into battle when he receives a desperate call from a buddy in Manila. No sooner has Jake landed in the Philippines is he shackled, kidnapped and thrown on a catamaran heading to the forbidden island of Su (Avellana, who confusingly played Jake’s mentor in the first film), where the kingpin has kidnapped the world’s best fighters to take part in a high-stakes, no-holds-barred martial arts tournament in shades of Enter the Dragon. Su is also revealed to be something of a chemistry whiz, manufacturing his own supercharged steroids which he feeds to his fighters giving them unrelenting superpowers. This is a typically hurried Z-grade quickie filmed with limited conviction, but somewhat salvaged by a cast of bona-fide professional heavyweights: Maurice Smith, Timothy Baker, James Warring, Richard Hill and, of course, Don “The Dragon” Wilson, who channels his best Bruce Lee impression to rally the troops and escape from Su’s island and his hoards of inept minions.